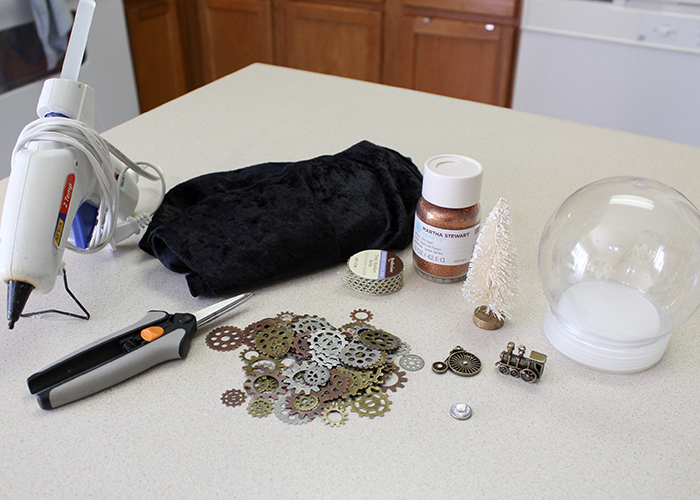 Today I’m going to show you how to make a Steampunk Snow Globe! 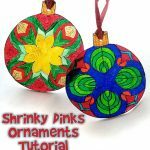 This is made with a plastic snow globe so it’s shatterproof, and waterless so it’s light and you can decorate it with anything you can find. 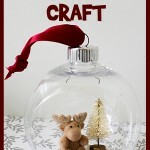 Plastic crafting snow globe. All of the supplies except the fabric were found at Michael’s, but might be available at other craft stores too. Glitter or Snow. 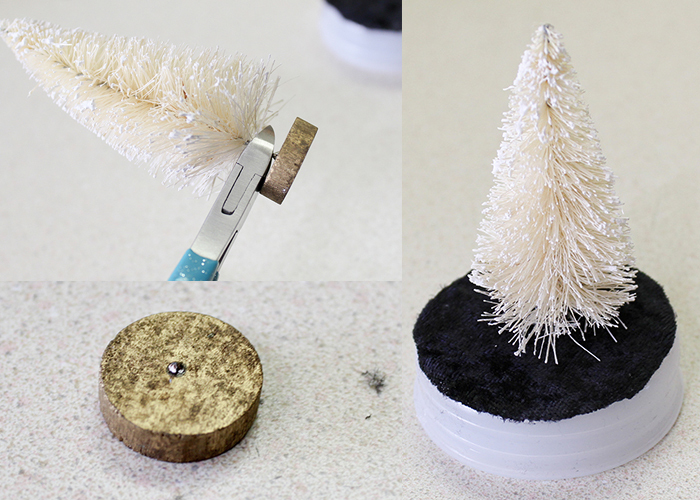 If I did this again, I would use a chunkier glitter or a snow product, because the super fine glitter I used tends to stick to the sides of the globe a bit too much. Fabric. I used a knit crushed velvet, but you can use any knit fabric. Small found objects. I used a little train, bike, jewels and pearls I found in the jewelry making section, but you can use anything small enough to fit. Glue. I recommend a hot glue gun, but a strong hold glue can be used as well. Wire cutters. Only needed if your tree is too tall with the base on. 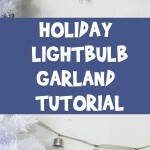 Start by taking apart your plastic snow globe. Mine has an inner and an outer seal in case you want to make it water filled. This one is waterless so it’s lighter, more kid friendly, and you can put anything you want inside. The inner seal is where you’ll build your scene. Trace it on the back of your fabric, and cut it out. Next glue your fabric on top of your base. My tree was a bit too tall with the base on, so I used a pair of wire cutters to trim off the base. Then I trimmed the extra wire off of the base and set that aside to use later. 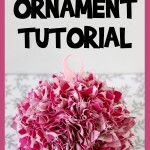 Put a large blob of glue on the bottom of the tree, and stick it down to the base. The next step is to decorate the base. You can get really creative with this, and make it look any way you’d like. Just remember that it has to be able to slide back into the globe, so decorations can go up, but not outwards. 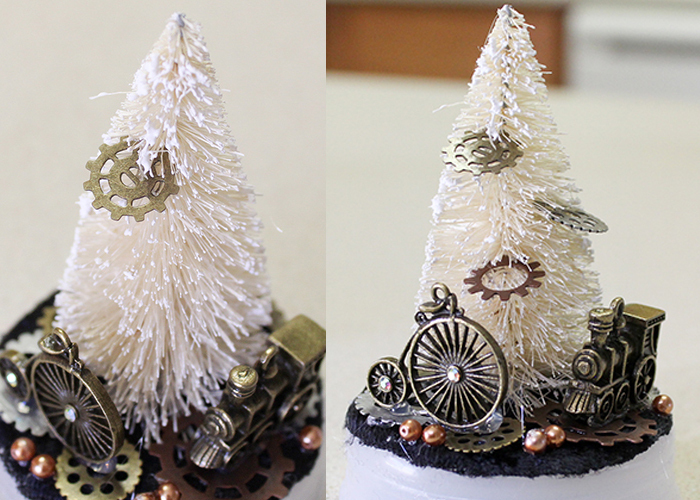 I placed a variety of gears down on the base fabric, then glued my tiny train and Victorian bike on top of them. Then I added a couple of small pearls. 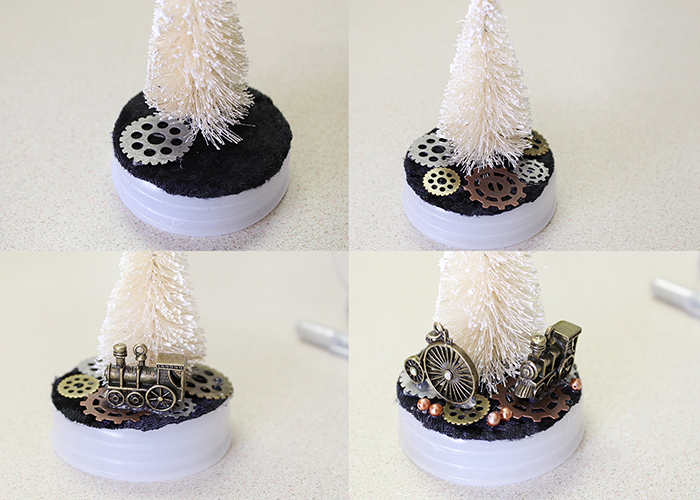 I thought the tree looked a bit plain, so I put some glue on the edge of the smallest gears and pushed them into the tree as ornaments. We’re all done with this inside part of the snow globe, so set it to the side for now. Now we’re going to work on the topper. This part is totally optional, but I think it helps the snow globe look more finished and pretty. Here’s where we’re going to use that wooden base we cut off from the tree. Mine was the perfect size and color to incorporate into the topper. 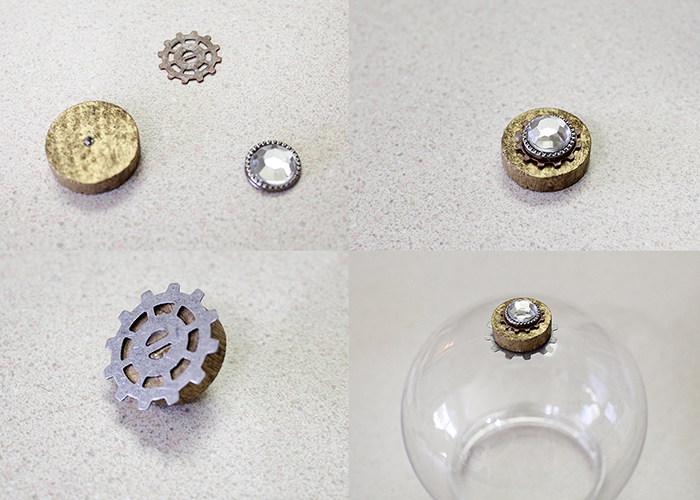 I just glued a gear on top of the base, and a jewel on top of the gear. Then I flipped the whole thing over and glued a larger gear on the bottom, and glued the whole thing to the top of the snow globe. 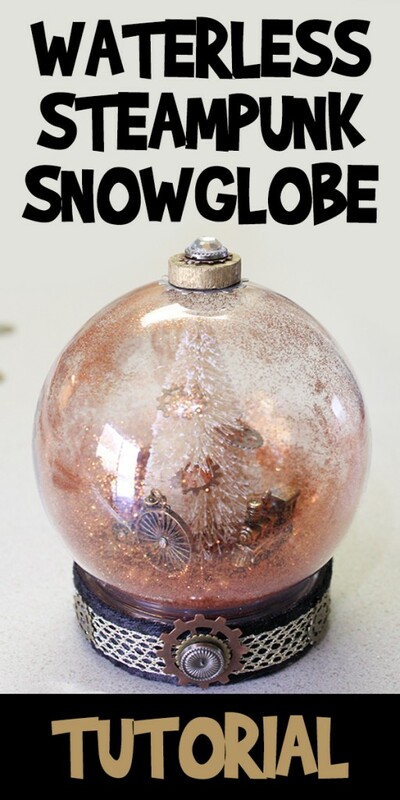 You can use all kinds of things to top snow globes with, so don’t be afraid to layer different things or try something unusual! Next I went ahead and added the glitter. I added way too much here, and ended up taking a good bit out. I would recommend start with a teaspoon or two, and then adding more if you want. I also used a super fine glitter, but I would use a chunkier glitter or snow so it doesn’t stick to the sides as much as mine did. Glitter is very staticky inside of plastic. 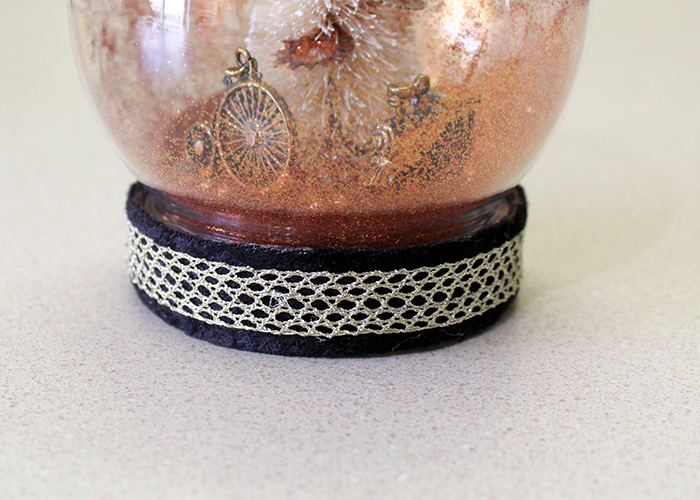 When you’re happy with the amount of glitter, go ahead and put your base down inside the snow globe! 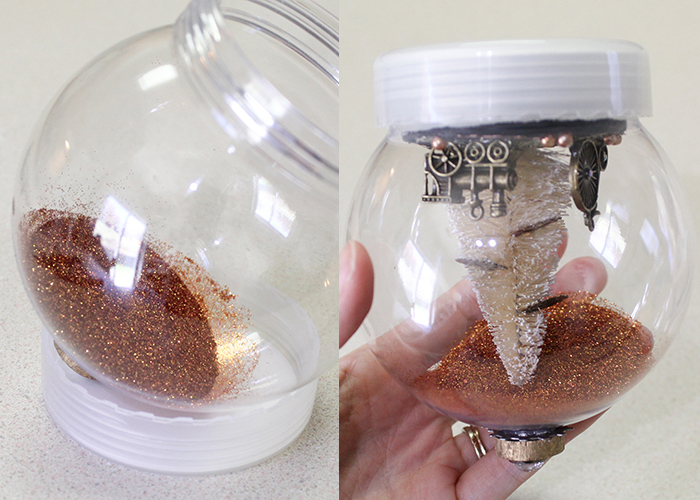 Here’s what it looks like with the glitter shaken up and the outside cab screwed on. Now it’s time to decorate that outer cap so it looks finished. 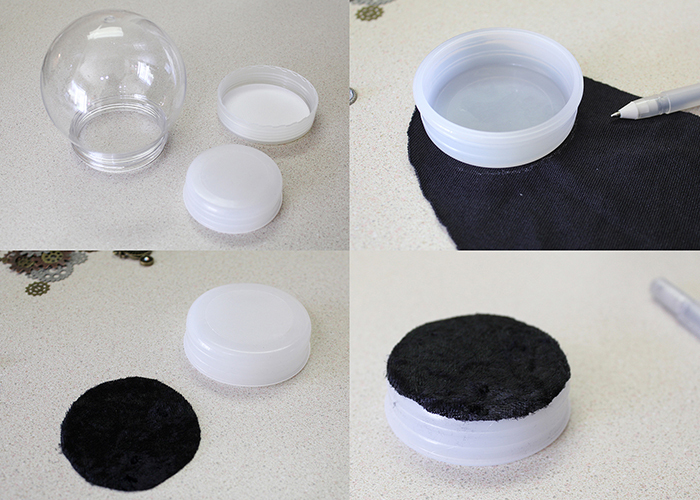 I took some of the extra fabric I had, and cut a piece to fit around the outside of the cap. 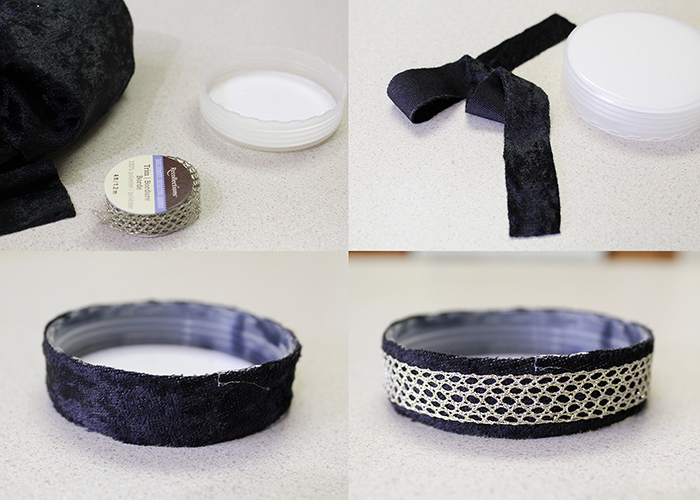 If you have a wider ribbon, you could use that as well. Next I glued that on, and then cut a piece of decorative ribbon and glued that on top. 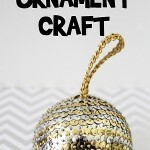 Before you start decorating the cap, screw it onto the globe so you know where to place everything. 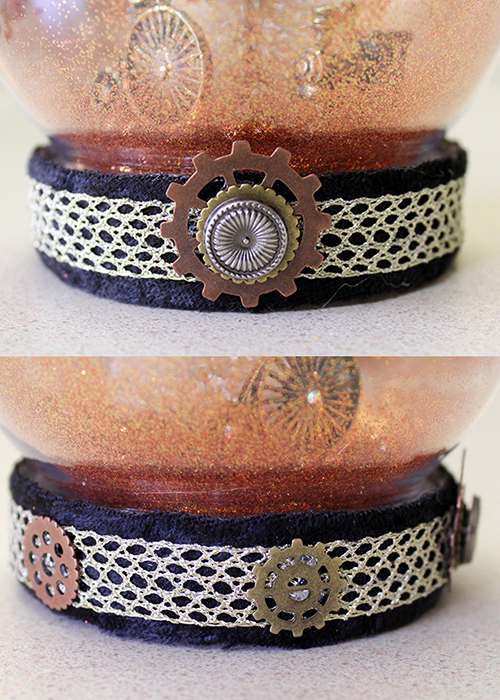 For the centerpiece I layered two gears and a little button like decoration. Then I just glued a couple random gears around the outside to finish it off. And you’re all done! 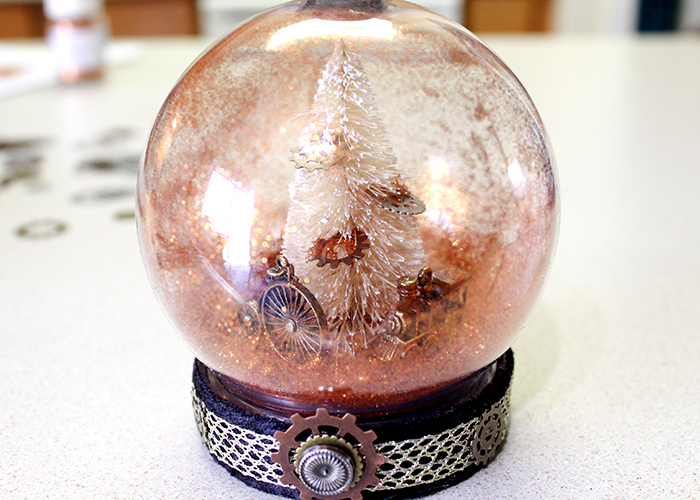 This Steampunk Snow Globe took less than an hour to make, and I loved how it turned out. 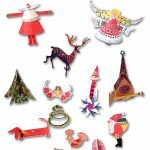 It’s unbreakable plastic and waterless, but it looks gorgeous on a shelf or tucked in with other holiday decorations. 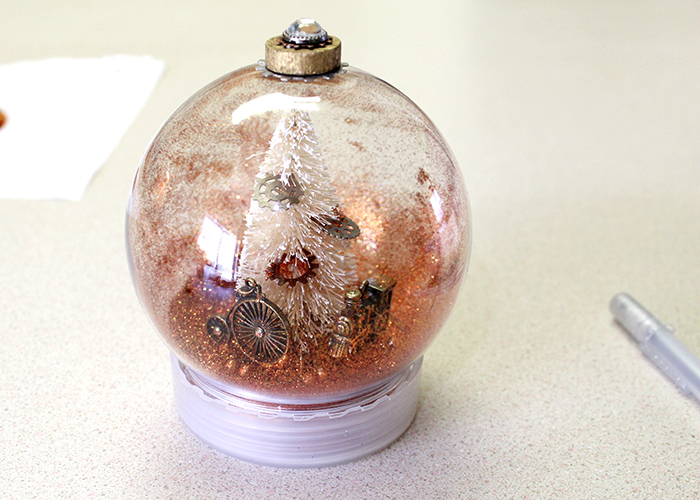 Remember, you can use this same tutorial to make a variety of fun waterless snow globes. A Parisian or nature theme could be especially pretty too!